(Bloomberg) -- Hong Kong’s chief executive cautioned that the Asian financial hub continued to face the risk of collateral damage from the China-U.S. trade war, saying the tensions were one reason why she’s joined the ranks of those tracking President Donald Trump’s tweets. On Thursday, Lam sought to reassure investors that Hong Kong still adhered to the rule of law and has an independent judiciary. She said she told a visiting congressional delegation that Hong Kong remained an important source of U.S. trade. Lam defended a proposed extradition law, saying it wouldn’t undermine business freedom. Her government in January proposed allowing the transfer of fugitives to Taiwan, Macau, mainland China or any jurisdiction with which Hong Kong does not have an extradition agreement, sparking concerns from the European Union, the local business community and some opposition politicians. A U.S. congressional delegation to Hong Kong earlier this week said the disqualification of lawmakers from the Legislative Council, the refusal to renew a visa for a Financial Times editor last year and the proposed extradition law all posed a major challenge to the “one country, two systems” principle under which Hong Kong was handed back to Chinese rule in 1997, according to Civic Party lawmaker Dennis Kwok, who met with the American lawmakers. 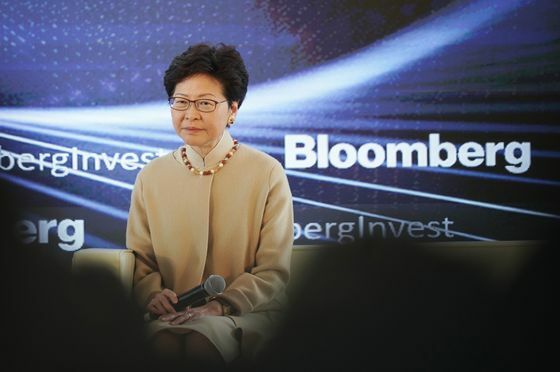 Lam on Thursday outlined a list of policy priorities for her government -- including new trade offices in Southeast Asia and local tax breaks -- meant to signal that Hong Kong remained an open and global financial hub. She said Hong Kong’s asset-management business could grow, and touted the city’s potential as an offshore hub for trading the Chinese currency. “The best strategy for Hong Kong is we don’t sit and wait until the external environment either goes up or goes down. We do the right things for Hong Kong,” she said in her interview, including creating more new markets and technologies. Lam also touted the benefits of the “Greater Bay Area,” Chinese leader Xi Jinping’s plan to better integrate the former European colonies of Hong Kong and Macau with China’s mainland. China’s long-awaited plan to create a high-tech megalopolis rivaling California’s Silicon Valley has generated optimism among Hong Kong’s business community, but thorny issues have so far been left out of the plan -- including complex questions about which customs, tax and legal systems will predominate. “Work on the Greater Bay Area is progressing well and progressing fast,” she said.